Professor Agnes Csiszárik-Kocsir works as an associate professor of Finances at the Óbuda University, Keleti Faculty of Business and Management. She is a doctor of Management and Business Administration. She got her PhD degree from Szent István University Management and Business Administration PhD School in 2010. Title of her dissertation is “The education funding aspects at local governments”. After that, she did her habilitation in 2017 at University of Kaposvár. 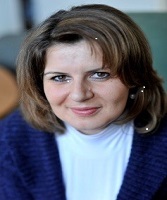 She worked at Central European University as a project manager and a visiting professor from 2004 till 2007. She managed several research projects at that time, and she was responsible for the finances of the projects. From 2007 she is a professor at Óbuda University. Her research fields are financing and the crisis. In recent years she had several research projects in connection with her courses: financial culture, corporate financing, investment funding, project management and project financing. She was a visiting professor in Romania, and in Poland (CEEPUS Award and Erasmus+ scholarships). She has more than 220 national and international publications, articles and conference proceedings as well. She helped in organizing more than 20 conferences, and she is a member of editorial boards in national and international journals (Lépések, The Macrotheme Review, Journal of Competiveness, Journal of Financial Management and Accounting), and she is a review board member in 2 international journals (Journal of Process Management – New Technologies International, International Journal of Trade). From 2015 she is an editor of the “Business Development in the 21th Century” book published by the Óbuda University. In 2009 she was the Yong Researcher of the year at Óbuda University.